*Using on Orion Atlas Mounts- Please specify to us if using on this mount. 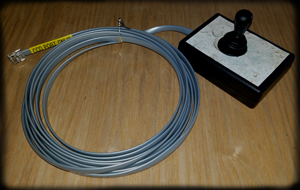 This wonderful device allows you to simply plug the device in to the CCD/Auto guider port on Meade or Celestron telescope mounts. Doing so allows you to observe the moon at high power and control the telescope with the joystick at a very slow speed, giving an Apollo port hole type experience. This is great for kids to control and interact with the telescope. Most telescope controllers are cumbersome and loaded with buttons that can be accidentally pressed by ones that are not familiar with them. It may also be used for high powered nebula's such as the Vail and Orion nebula's, other uses can be to manually align guide stars in astrophotography. Listed below are some of the telescopes: Meade LX50 LX200 Classic LX200 GPS LX200 16 in SCT LXD650 LXD750 Celetron CPC Series Nexstar Series CGE CGEM, Astro Physics, Orion Atlas. Disclaimer: We are not responsible for damage or repairs required as a consequence of misuse or applications other than the intended use of this product. This includes damage due to improper connectivity of any electronic equipment such as hot plugging, etc. other than what is specified. Please verify all your pin connections and cable requirements from your manufacturer as well as any safety measures, If you have any questions, please contact us.